Vytek's revolutionary new L-Star sets the standard for versatility, high productivity and low cost of ownership while delivering unrivaled speed (up to 175 ips), acceleration (10 g's), accuracy and return on investment. The L-Star is the only high performance large format laser system designed for fast job turnaround time, reduced cost of labor, and applications versatility. The L-Star Series line is ideal for stone fabricators, kitchen and bath manufacturers, memorialists, stone and tile shops, floor installers and home and commercial builders. Artisans can quickly reproduce text and graphics to unprecedented detail on many stone and marble materials by using artwork created on the computer or from photos or drawings. The traditional methods of using harsh chemicals or hand etching are now obsolete. 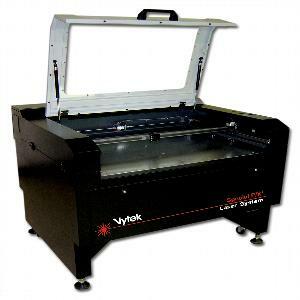 The VyTek F Series is the ideal laser system for the small to medium sized shop with 4 sizes to choose from. It’s the only system available in the industry that can accommodate larger jobs while still being able to produce the smaller jobs efficiently. With the fully enclosed portable design and built-in downdraft fume evacuation table, these units can even be operated in an office environment.The F Series is also one of the fastest engraving systems ever offered-boasting an impressive speed of 60 inches per second. It can produce a square foot of etching in as little as 12 minutes. Lastly, the system is easy to set up. Just plug it in. No special wiring or cabling is needed. 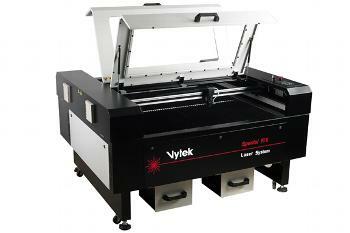 VyTek is proud to introduce the FX2 to it line of F/X Laser Systems. Like its predecessors, the FX2 is a fully portable and enclosed laser system with cutting and engraving capabilities. The FX2, with its redesigned appearance, has a smaller footprint of 41” x 48” but doesn’t compromise the large work area within. Combined with the auto focus feature, fire-on-the fly, image optimization and VyTek’s state-of-the-art beam delivery system, the FX2 outperforms the competition in speed, quality, and reliability.